Wellington, FL – March 2, 2018 – Twenty-four-year-old Lacey Gilbertson (USA) claimed a victory in the $35,000 Hermès Under 25 Semi-Final Grand Prix riding Baloppi under the lights in the International Arena on Friday, March 2, during week eight of the 2018 Winter Equestrian Festival (WEF). In Friday night’s class, 47 starters jumped the first-round track set by Ken Krome (USA) with seven pairs advancing to the jump-off. The top three finishers all posted fault-free rounds, making foot speed the deciding factor for the final placings. Gilbertson and Baloppi, an 11-year-old Danish Warmblood mare owned by Seabrook LLC, crossed the timers in a blistering 40.21 seconds for the win. Second-place finisher, Ailish Cuniffe (USA), returned first in the jump-off to lay down an early pace in 41.70 seconds aboard Baloucento 2, a 13-year-old Oldenburg mare (Baloubet du Rouet x Cento) owned by Whipstick Farm, Ltd. Third place went to Ransome Rombauer (USA) and her own Emorkus RE, a nine-year-old KWPN gelding (Quasimodo van de Molendreef x Haarlem). A new combination in the ring went to the winner’s circle in the $50,000 Hollow Creek Farm 1.50m National Grand Prix over 34 other competitors. Darragh Kenny (IRL) and Babalou 41, owned by Jack Snyder, were the only double clear in the class, winning on a time of 39.945 seconds. Second place went to Rodrigo Lambre (BRA) and Mario Onate’s Chapilot, who had four faults in 38.513 seconds. Mario Deslauriers (CAN) and Bardolina 2, owned by Wishing Well Farm LLC, were third with four faults in 39.778 seconds. Friday’s competition began in the DeNemethy Ring with Annabel Revers and Quax, owned by Beechwood Stables, LLC, claiming the blue in the Platinum Performance USEF Show Jumping Talent Search 3* class. The pair aced the open water jump and challenging course of bending lines and returned as one of the top 12 competitors to impress the judges in the flat test. Ava Stearns was close behind with a second-place finish aboard her mount, Mac One III, owned by Lauren Hough, and Emma Kurtz took third aboard Carl, owned by Dr. Betsee Parker. Lexington, Ky. – May 20, 2016 – Hunter Holloway showed her skills in the Kentucky Spring Classic, bringing home wins in both the hunter and jumper rings. In the Medium Junior Jumpers, Holloway took home the victory aboard Italia, a 7-year-old Dutch Warmblood gelding, with a time of 51.098 seconds, a full four seconds faster than second place finishers Ashley Hartman and Clear Lady. It was a meaningful win for Holloway, who has done the majority of the training on the home-bred Italia. After her win in the jumper ring, Holloway headed over to the Stonelea Ring and brought home a win in the WIHS Equitation Hunter Phase with Orion, a 12-year-old Westphalian gelding. Holloway was enthusiastic about her first trip to the Kentucky Spring Classic. The Kentucky Spring Horse Shows allowed for Holloway to spend more time in the jumper ring as well as continuing with the hunters. Madison Dehaven and Chanel brought home the win in the Low Amateur-Owner Jumpers for the second week in a row with a time of 24.013 seconds, a full two seconds faster than second place Alexandra Duval and XM. Dehaven was full of praise for Chanel, her 8-year-old Irish Sport Horse mare. From the start, Dehaven made a plan that paid off in time saved. The Kentucky Spring Classic, running through May 22, features a FEI CSI3* rating. On Saturday, May 21, riders will compete under the lights in the Rolex Stadium during the $130,000 Mary Rena Murphy Grand Prix. All three FEI classes held during the Kentucky Spring Classic count for the Longines Ranking List and the Saturday classes will also count for the Rolex/USEF Show Jumping Ranking List. In addition, the featured national classes will be the $50,000 Bluegrass Grand Prix, which counts towards the Rolex/USEF Show Jumping Ranking List, and the $25,000 Under 25 Grand Prix to be held on Sunday, May 22, in the Rolex Stadium. Sixteen-year-old Annabel Revers of Weston, Massachusetts, rose to the top of 16 entries in Friday’s ASPCA Maclay horsemanship class in the Stonelea Ring at the Kentucky Spring Classic aboard Beechwood Stables LLC’s Quax. Revers and Quax are frequent blue ribbon holders in the equitation ring, and even won the same class together at the 2015 Kentucky Spring Classic. 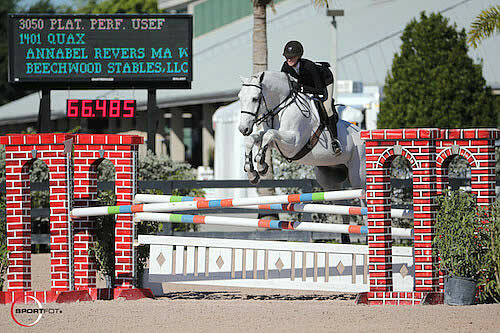 Revers piloted the 13-year-old Oldenburg gelding around the equitation course, made up of 10 fences, under the guidance of trainer and Olympic gold medalist Peter Wylde. 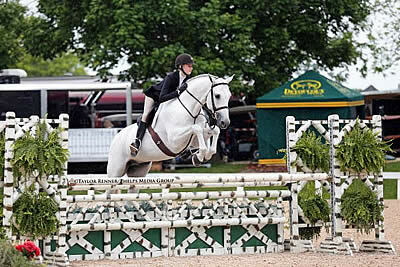 The track consisted of challenging bending lines, single obstacles, an in-and-out and a large log wall fence leftover from the $15,000 USHJA International Hunter Derby during the Kentucky Spring Horse Show. Despite the over fences test Revers was tasked to complete as well as the rainy weather seen during the class, she rode a flawless and fluid round that undoubtedly impressed the judges. Revers’ equitation caught the judges’ attention once again during the flat portion of the class, where she secured the first place spot. “I’ve had Quax for about a year and half now,” said Revers. “We got him as a jumper and over the past year and a half we’ve been turning him into an equitation horse. He was really good today. I was really happy that he stayed relaxed and was really good and did his job. Revers has been coming to the Kentucky Horse Shows for years and always loves returning to the world-class facility at the Kentucky Horse Park. Second place honors went to 17-year-old Summer Hill and Poden Farm’ Aster De La Cense. Hill trains with Andrea Simpson and Ken and Emily Smith of Ashland Farms. This class was only the second time Hill had ever ridden and shown the 6-year-old Selle Français gelding, but the pair proved to be top contenders in the competitive junior equitation ring. “I didn’t really have a plan,” said Hill. “I’ve only ridden the horse twice so it was just kind of however it goes. He’s only 6 years old so I had to make up my plan as I went, but he was really good. He really showed himself in the ring so I’m really happy with him. Hill also recently moved from California to the Bluegrass State and enjoys being in close proximity to the Kentucky Horse Park in order to compete at the Kentucky Horse Shows. The Kentucky Spring Classic will continue through May 22 with the $5,000 Hallway Feeds USHJA National Hunter Derby in the Stonelea Ring on Saturday, May 21, while also offering WIHS and NAL qualifiers plus $10,000 Show Jumping Hall of Fame Classics. Kentucky Horse Shows is also pleased to host a book signing with George H. Morris for his newly released autobiography, Unrelenting: The Real Story: Horses, Bright Lights and My Pursuit of Excellence. The book signing will be held on Saturday, May 21, during the $5,000 Hallway Feeds USHJA National Hunter Derby at the Stonelea Ring. Come and meet legendary horseman George Morris, take a photo and purchase a signed copy of George’s autobiography, which illustrates the story of his life, from the very public to the incredibly private, while also enjoying hunter derby action from the second leg of the $40,0000 Hallway Feeds USHJA National Hunter Derby series! Lexington, KY – May 15, 2015 – Annabel Revers has become a familiar face in equitation ring, and today the 15-year-old rose to the top in a field of 29 entries, taking home the blue ribbon in the ASPCA Maclay Horsemanship Class at the Kentucky Spring Classic. The young talent from Weston, Massachusetts placed fourth last week, but came back today with Quax ready to win. The pair impressed the judges with a smooth trip around Bobby Murphy’s course, which included an in-and-out to a single on a bending line, rollbacks and a brush jump. Revers’ equitation also stood out on the flat, where the judges asked the riders to show at the walk, working trot, sitting trot and canter. The pair rode away with the win, continuing on the path to Regionals, which Revers has already qualified for. Coming in second place behind Revers and Quax were Sophie Simpson and Clifford, an entry from Blue Hill Farm LLC of Wellington, Florida. Although 16-year-old Simpson competes regularly in the equitation ring, her horse Clifford is brand new, doing the Maclay for only the second time today. Simpson has also qualified for Regionals and is looking forward to competing there, with her sights set on eventually qualifying for Finals. Third place went to Martha Ingram and Tenacious, owned by John and Stephanie Ingram from Nashville, Tennessee. Helen Voss and Mark Bone’s Cashmere took the fourth-place spot, with fifth place going to Elizabeth Bailey and her horse Acido 7. 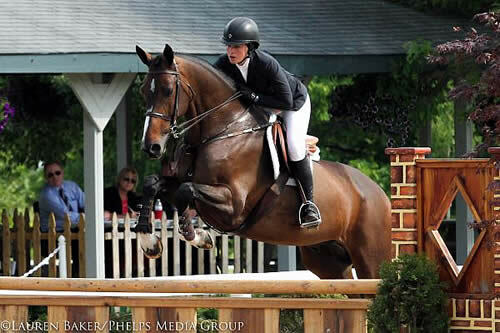 Rounding out the top six were Anna Bremermann and her horse Pretentious K.
Up next at the Kentucky Spring Classic is “Derby Day,” with the $5,000 Hallway Feeds USHJA National Hunter Derby taking center stage.